The creative process – Everyone talks about it. Everyone seems to have an idea about what it is, how it works and how best to make it happen — how to capture it and ride that wave. Is it a matter of shutting off our conscious mind – the part of us that pays attention to whether the gas bill was paid or if we have enough coffee in the cupboard to last the week? A matter of allowing our imaginations free rein to connect with all those alternate souls who inhabit the theater gallery of our mind? And for mystery or crime writers what is it that compels us to move into the darkness, the pathology of a killer’s mind, to dwell on the unimaginable? Maybe we’re all just a little bit weirder than most people. I admit – I have a suspicious mind. And maybe that’s an essential thing for a mystery writer. I’ve never been able to take things or people at face value. I want to know all about the man who jumped off the bridge. I want to know what made him tick. What did he do for a living? Was he married? Children? What forces led him to that act? I used to be very good at ignoring my instincts, my first impressions, but as time went by, I learned to pay attention – to listen to the atmospheres around me, the crackling of ionization in the air. Eventually I accepted and trusted my gut reactions. Our society admonishes us to be polite, politically correct, do the right thing, not think badly of others, and slowly but surely we’re trained to dismiss our first instinctive reaction. That person I just met – why did I have that instantaneous feeling? Did I sense an immediate bond? Or did he (or she) make my skin crawl? And why? Could that lovely polite man who runs a shop in my neighborhood have a secret practice? Is he hiding something from his past? Suspicions about a neighbor who comes and goes at odd times of the night — why was he digging for hours in his back yard? I haven’t noticed any new bushes or petunias lately. And who knows if his wife really did leave on that trip? The more normal and everyday someone appears, the more my brain goes into overdrive. I just don’t believe it. Nobody can be that ordinary – they must be hiding something. But for a writer, how does a story take shape? Do we sit at the keyboard and await inspiration? Hoping to be bonked on the head by the fairy wand of our muse? Waiting to be hit by the lightning bolt of brilliance? Or do we ferret out some tiny little thing that’s been haunting us for a while – a snippet of a story read on the web? Some small event that eats away at us until it emerges full blown into a story idea? The “what if” of a neighbor whose daily routine suddenly changes, the “what if” the witness to a crime was really the perpetrator? What is that alchemy that takes place when thoughts, feelings, or free-floating ideas converge into a plot? As I was finishing the last revisions of A Spoonful of Murder, the first book in the soup shop series, I was terribly anxious to complete the project. I was convinced that somehow, some way, huge hunks of the story line of the next book in the series, A Broth of Betrayal, were plunking themselves down in my overworked gray cells. The plot and story were forming in my head. I was fearful I might lose what was coming through, like a dream that evaporates like a whiff of smoke upon wakening. And, like an idiot, I was sure that when I started to plan and plot the third book the same thing would happen. It didn’t. I waited. Nothing. No fairy sparkles were meshed in my hair. What was I going to do? How could I come up with a story? I had a deadline for heaven’s sake! And nothing, absolutely nothing was running around in my brain. Then it happened. A couple of things popped into my consciousness. Well, actually one thing. It was a story that caught my eye when I clicked open my email. A news article about eleven Romanian gypsies arrested at the Canadian border. That was the lead in. I double-clicked on the story, fascinated at the juxtaposition of a Canadian Mountie (not sure if the Canada Border Patrol is manned by Mounties) clashing with a brightly painted caravan of fortune tellers in long skirts and scarves toting crystal balls. I’m sure the reality looked nothing like that. The eleven Romanians were probably traveling in four muscle cars and creeping along a fire road that would take them eventually to the U.S. But I was still fascinated. What were Romanian gypsies doing in Canada, attempting to illegally enter the U.S.? The second thing that had been hanging around in my consciousness even though I was only dimly aware of it was the sound of a song sung in Gaelic and played by a woman with a stand up bass and a bow. It followed me around. It was haunting and beautiful and in its strange language, the melody of the music sent shivers up my spine. It would not leave me alone. And that was the kernel of the beginning of the third book in the soup shop series, now entitled A Roux of Revenge. Do I have any answers about the creative process? No, I don’t think so. I have absolutely no idea what it is or how it happens. Maybe the secret is to just listen to the unspoken sounds around you, to listen to the spaces between the notes. Connie Archer is the national bestselling author of A Spoonful of Murder, the first in the soup lover’s mystery series from Berkley Prime Crime. 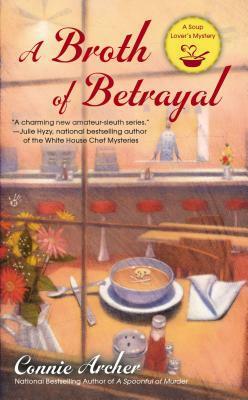 A Broth of Betrayal was released on April 2, 2013. 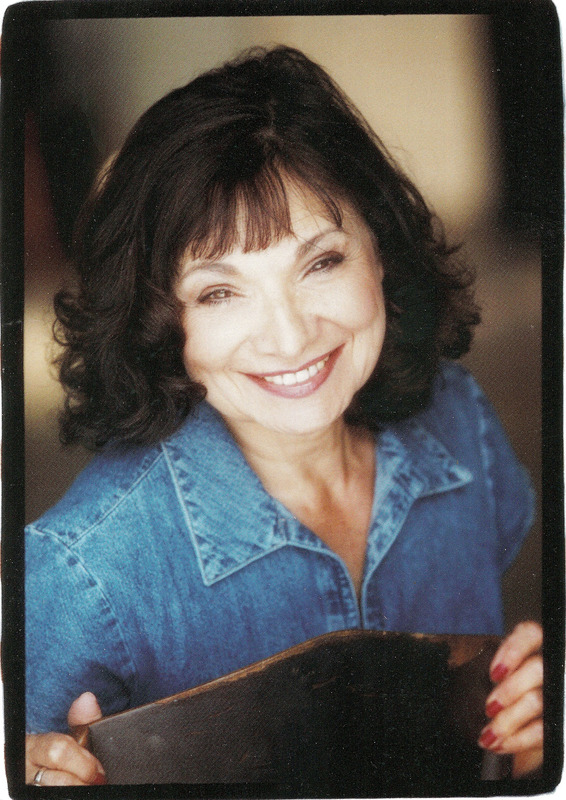 Connie was born and raised in New England. She now lives on the other coast. Snowflake, Vermont is picturesque town frequented by tourists from the nearby Snowflake Ski Resort during the winter season. Off season it is home to year round residents, many who own businesses supported by the tourists. But there is a new business trying to open and none of the residents are happy. An ugly car wash has been approved by the town council and the people are protesting with a march in front of the site. Then all of the sudden the digging stops, it seems they have uncovered a skeleton that may date back to the Revolutionary War. The town is then shaken by two more discoveries. Local mechanic, Harry Hodges, has been found dead in his shop and the mayor of the town, Lucky’s friend, Elizabeth has gone missing. Lucky plans to use her noodle to find her friend and the killer no matter how much trouble she stirs up. This book is full of wonderful mysteries, a skeleton discovered, a missing person, and a murder. The pages flew by. Archer has created such lively characters. Lucky is a strong protagonist who doesn’t mind finding herself “in the soup” as she tries to save her friend or catch a killer. Her romance with her middle school crush, Dr. Elias Scott is progressing nicely. My favorite character is Lucky’s grandfather Jack, a retired Navy man who still tells time according to bells. He is devoted to his granddaughter and truly her right arm as she runs the business left to her by her parents. I found the historical element in this story very interesting. Bodies hastily buried during the Revolutionary War being found today like this one can have a very eventful story when researched. The reenactment of The Battle of Bennington was a great way to tie this element together in this town to with a sultry summer activity. I was also intrigued by the story that evolves as historic towns try to stay true to the historic quality and feeling as modern needs try to fit in. The car wash may have not been so bad with a few architectural elements to help in blend in with the surrounding businesses. 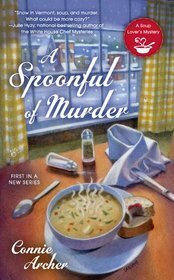 After reading the first book in this series, A Spoonful of Murder, I knew the author had a “souper” idea for her cozy series and that her stories would be filled with drama. She exceeded my expectations with this installment. I liked it even better than the last. She gives us a taste of the next story, A Roux of Revenge, and she has definitely whetted by appetite for more. My next visit to Snowflake cannot come soon enough! Leave a comment for Connie for 5 Bonus Entries ! Thanks for a peek into the creative process. 🙂 The books sound yummy. Hi Judy ~ I hope you get a chance to visit Snowflake! Thank you for the giveaway! I love to read! You’re welcome, Kathleen ~ best of luck! I think you’d really like this series, Melissa ~ the characters are so real to me now, I think about them a lot! I don’t know if it’s everyone’s method ~ I truly don’t know what works. Sometimes I bang my head on the desk and that helps! Covers look great. 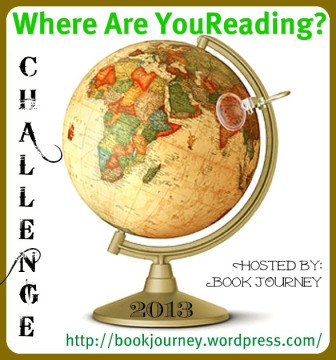 I loved hearing about your inspirations for these stories. Looking forward to trying out this new (to me) series. Best of luck, Linda ~ I’ve been so happy to hear how much readers love this series. I can’t wait to read this. The town of Snowflake, Vermont really appeals to me. It sounds like a great setting for a murder mystery. Ah . . . Snowflake is a wonderful village, with lots of buried secrets! Good luck, Jennifer! Can not wait to get started reading this! Love hearing people get their inspirations. Other writers have told me similar things, too. Enjoy Snowflake, Donna! This series is on my To Be Read list. Sounds Great. Thanks, Dotty! Good luck ~ hope you love Snowflake! Lots of recipes at the end as well, Dee ~ focused on soup, but sandwiches and salads too, just like at The By the Spoonful Soup Shop. Looking forward to this one as I really enjoyed the first in the series! Thank you, Alicia! Lucky has some great adventures in A Broth of Betrayal! I enjoyed the first book so I can’t wait to read the 2nd. With all modesty, I think you’ll really like A Broth of Betrayal, Sandy. Good luck! What’s more cozier than soup on a cold day, can’t wait to read it. I agree! The winter was very harsh in A Spoonful of Murder, and I thought the village deserved some warmth. Recipes for chilled soups too in A Broth of Betrayal. This series sounds wonderful and I have added it to my TBR list. Thank you, Amanda ~ I’ve been so excited to hear good things from readers. Best of luck! Congrats on the release Connie! Great interview Lori. I was wondering what your favorite soup is Connie? Is there any kind that you dislike? I really do like any kind of soup, but I’m particularly fond of tomato based soups, but then there’s a mushroom, meatball, parsley soup I really love, and then . . . oh well, I’m getting hungry, I better stop! LOVE a good mystery!! And since I work for a company that installs car washes, this is a great book for me to read, lol. That’s great! I hope your boss is nicer than the guy I wrote about . . . ooops, don’t want to give anything away too soon. Good luck, Cindi! Great insight and the book sounds GREAT! Thanks, Nancy! If there’s no fairy dust, I really have been known to bang my head on the desk! I have been hearing great things about this book and would love to read/review it! Hi Rhonda ~ Thanks so much for sharing on FB! I’m thrilled you’d like to review A Broth of Betrayal. You can contact me directly at conniearchermysteries@gmail.com, if you like. And thanks again to Lori for hosting me! I agree, there is no such thing as a perfect person, and if they pretend to be perfect they’re definitley hiding something. Ah . . . another suspicious mind ~ you must be a mystery writer or a mystery reader, Peggy. Best of luck to you! Big time mystery reader, and enjoyer of the mysteries of life. I love to listen to people tell me about what happened, and what led up that happening. I’ve only found the time to take one of those stories and put it to paper, but I’m working on the rest. Someday I’ll get more of them completed. The historical aspect in a cozy is always interesting to me. Thanks for the interview, review and giveaway. Hi Vesper ~ hope you enjoy Snowflake VT! Love this interesting combo. Very unique. Thanks for this great feature which sounds compelling. Hope you enjoy A Broth of Betrayal, Ellie! I love your writing style ! Thank you for a lovely compliment, Kathy ~ very appreciated! Thanks, Elizabeth! It’s been tremendous fun writing it too . . . even on the days when I bang my head on the desk for ideas! Thank you for the chance to win this book. I love the titles of these books and the idea around them. Thanks, Angela ~ There is something so inviting about village murders, isn’t there? Plus soup! Hope you get great reviews of the book. Hi Gloria ~ thank you! I hope you get to visit Snowflake VT too! Great posting Connie. An eloquent treatment of a process that has remained for too long misunderstood and cryptic. You revealed the magic that we all feel and what makes us want to keep coming back to the keyboard. Thanks, Chris! Sometimes I hear the keyboard calling my name . . . it’s weird! I enjoy a good cooking cozy—-and hope there are always good recipes included. Hi Sue ~ Yes, definitely recipes at the end of each book. There are lots mentioned but not always enough room to add them all to the finished book. A reader contacted me about one particular recipe, so I posted a blog about it with the recipe. You can check it out at “The Neglected Artichoke” at http://www.conniearchermysteries.com/blog. Two of my favorite things in one book…soup and a cozy mystery. This definitely looks like a series I’ll have to try! Thanks for the giveaway. You’re welcome, Mary. Snowflake VT has murder, excitement, intrigue and recipes too! Best of luck! Your “A Soup Lover’s” series sounds so fun, I will be checking it out. That’s great, Merry — thank you! I hope you’ll love Snowflake VT.
I’m new to this series, but I love the titles you came up with for your books! Which do you do first – pick the food and then write around it, or write first and then pick the title? Thanks for the giveaway!! You’re welcome, Bonnie ~ I usually think mostly about the plot, and the recipes are suggested by the season for each book. I always have a bunch of titles rattling around in my head and offer several to the publisher and let them pick. The titles in this series are really fun! These books always leave me hungry for more! LOL! I agree, I have to take lots of breaks while I’m working and head for the refrigerator! Thank you for the wonderful giveaway. This sounds like a marvelous read. It was interesting to read about your inspiration. I always find that the most unexpected things inspire me. You’re welcome, Irene. 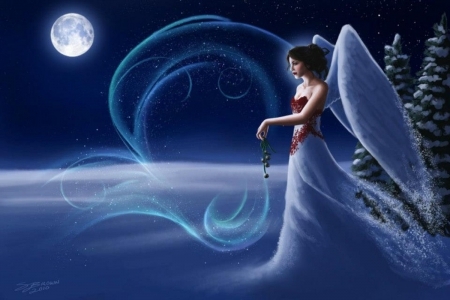 When inspiration happens, it really does feel like fairy dust, doesn’t it? this sounds like a book I would enjoy reading. I hope I win. Best of luck, David – I do think you’d like the whole series and hope you get to visit Snowflake VT.
My daughter loves cozy’s, thank you for the chance to win one for her. Best of luck, Wendy ~ so glad to hear of a cozy fan! Thanks Angela ~ I think the publisher did a great job with the cover art. Hope you like the inside just as much! Loved the first book in the series- cant wait to read this one! So nice to hear that, Samantha ~ I hope you like “A Broth of Betrayal” just as much — good luck with the contest! Hi Lethea ~ Yes, there are more to come! The third book in the series is now titled “A Roux of Revenge.” I hope you really enjoy A Broth of Betrayal. All the best to you! Looks good! I don’t understand the creative process at all but I sure appreciate writers who can follow through on it! Thanks, Elaine ~ sometimes it feels like climbing a mountain, but there are good days too. Best of luck to you! Love to t ry it! Hope you love Snowflake VT! Good luck! I’m thrilled to connect with so many mystery lovers and cozy lovers. Hope you visit Snowflake, Vermont! Looking forward to reading this series. First one is coming up on my TBR list. I’d love to win a copy so I could get current on this series. Culinary cozies are my favorite! Good to hear! I hope you really enjoy the first one — A Spoonful of Murder. And best of luck in winning a copy of A Broth of Betrayal! Interesting post. Love cozy mysteries, especially dealing with food. Love the covers. Thanks for sharing.